Everything we can do as volunteers is critical to delivering our overall mission. Earlier this summer, Jennifer Van Houten, a senior vice president with Wholesale Banking Risk Management at U.S. Bank in Portland, assumed governance responsibility as the new incoming board chair for the American Red Cross Cascades Region. 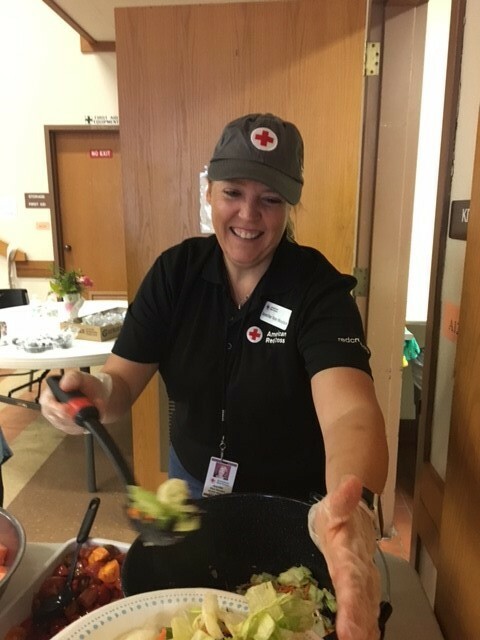 Jennifer has served the Red Cross Cascades Region in a variety of capacities in the past five years, including holding positions as vice chair of the board and chair of the American Red Cross of the Cascades Capital Campaign for two years. She was also chair of the Disaster Cycle Committee for a year. In addition to her work with the American Red Cross, Jennifer is a member of Mazamas, a nonprofit mountaineering education organization located in Portland, Oregon. We caught up with Jennifer shortly after she returned from helping people who had their lives displaced as a result of the Eagle Creek Fire – a wildfire that has destroyed thousands of acres in the Columbia River Gorge. What drew you to join the American Red Cross? JVH: About five years ago, I was asked to replace an outgoing U.S. Bank board member due to my interest in back-country preparedness. He was, at that time, stepping down from the board. I was the one in the office who was always giving the earthquake preparedness talk and making sure everyone knew where to evacuate in the event of an emergency, so this was definitely a good fit for me, given the Red Cross’s preparedness mission. I’ve been hooked on the American Red Cross ever since. The people and the mission in this organization are incredible. Do you have a favorite Red Cross story? JVH: I have to say that the resilience shown by all the people affected by the recent wildfires in the Columbia River Gorge has personally touched me. I volunteered at the Red Cross shelter in Stevenson, WA, and assisted individuals displaced by the fires. The perseverance of those affected and the compassion I saw the Red Cross volunteers give to those people – while simultaneously providing food, shelter, and basic needs so they didn’t have to worry about that part of the crisis – was heartwarming. As the new board chair, what is your highest priority? JVH: We are embarking on a new beginning for our local Red Cross. We have a new CEO locally and new board members coming on board. My priority right now is trying to build awareness with those board members concerning ways in which they can get the Red Cross message out there. I am also focused on continuing to build on the strong corporate partnerships that are critical to the Red Cross’ ability to deliver on its mission. What should people know about the Red Cross? JVH: The Red Cross’s mission is “to prevent and alleviate human suffering in the face of emergencies by mobilizing the power of volunteers and the generosity of donors.” Although the Red Cross responds to disasters alongside our government partners, we are not government funded, and we rely on the generosity of donors. We’re also more than 90% volunteer driven. Therefore, everything we can do as volunteers is critical to delivering our overall mission. What advice do you have for people who are interested in the Red Cross? JVH: The Red Cross could not exist without all its volunteers and generous donors. There are plenty of ways to get involved. Reach out to the local chapter at redcross.org/cascades. Start with taking a class, or volunteering to install home smoke alarms in homes that need them, or learning how to respond to home fire incidents where immediate help is needed. Or, if you really develop a passion, become trained to participate in sheltering operations (either locally or perhaps to be deployed across the nation). If you can’t volunteer, make a financial donation at redcross.org or call 1-800 RED CROSS. You can designate where your donation should go, and Red Cross always honors donor intent. There are plenty of ways, big and small, to become involved. What is in your “go bag”? JVH: Which one? Actually, I have three…one at home, one in the car, and one in the office. I encourage people to put together kits for the home, at work and in the car. Water, nonperishable food items and a first aid kit are essential to a go bag. Kits can also include an extra set of clothes and helpful items like flashlights, duct tape and toilet paper. A list of recommended items can be found at redcross.org/PrepareGuide. How have you prepared yourself and family in the event of an earthquake? JVH: We’ve established a communication hub with someone outside of the area where everyone can call in with updates, and we’ve put together a plan. Our plan makes sure we all know where we intend to meet in the event of an emergency. I’ve also made sure that I have durable walking shoes and warmer clothes (in the winter) in my office in case I have to walk home from downtown Portland for some unexpected reason. For more information and resources, check out redcross.org.